Layered Hairstyles have remained at the top of the styling charts for so many years. The main reason is they provide dimension and movement to the manes with very less styling effort. All hair lengths can be limp or flat when not handled properly. By incorporating layers, one can add an instant spice of movement. Moreover, they are very versatile. One can choose to wear her hair down, tie in a ponytail or go for a bun, layers will make each style elegant than ever before. As of a simple rule: The layered cuts are more interesting and alluring than the single length styles. Hence, incorporating layers is an instant dose of adding the dimension to otherwise flat, dull, and boring locks. 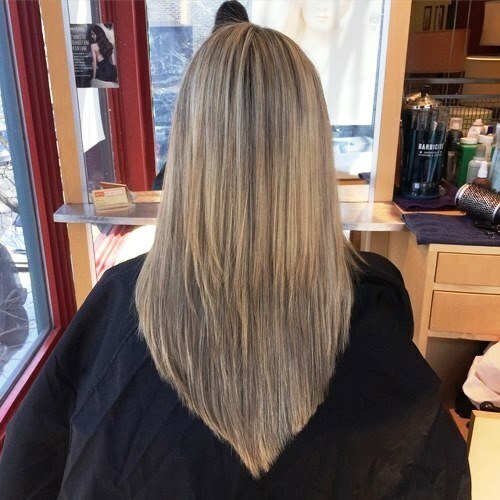 From incorporating delicate to heavy layers, one can get a great transformation in no time. There is enough room to manipulate the ends, either flipped or flicked, they add a beautiful spice to the overall image. A lob, a bob, medium length locks, long length manes, layers can add flattering movement and bounce to all hair types. There are so many color dying options that complement these styles. The modern coloring techniques have further made it easier to manipulate the conventional hair hues. Hence, get your hands on these traditional as well as modern Layered Hairstyles, when you plan your next salon visit! No doubt, provide a great solution to impart movement and dimension in otherwise limp and flat hair. This hairdo features a medium length, which is considered as the most manageable in the hairstyling industry. Besides being manageable, this length provides enough room to play with the different forms of textured ends. As in this case, the stylist will incorporate heavy layers at the bottom. The relatively longer front side manes create a face framing effect. Furthermore, keep the locks free flowing to get a mesmerizing feeling in a cool meadow breeze! This Layered Haircut is a dream of most of the women blessed to have long locks. The vital and glamorous secret of this long hairdo is the blend of short, medium, and long layers. A straightening rod will help to keep the hair straight and sleek. And if you have naturally straight hair then, this is a plus point as the heating rod is not required in that case. The front layers are kept short and then from the back side, layer length keeps on increasing gradually. The perfect jet black color goes well with this hairstyle. However, one can choose a color of one’s own choice to rock this simple yet elegant cut. This one of the trendiest Layered Hairstyles is a must try for the ladies having super thick manes. Layers impart an instant dimension and body to locks. However, the blend of top layers and flicked ends is another glamorous solution to remove the heaviness from thicker manes. A nice blow dry job is necessary to replicate this look in its true sense. Moreover, use a double tone dye to get a more dynamic look. Lobs are hitting the style charts for so many years. These Layered Hairstyles let women wear a relatively short length in a way which is feminine as well. This is why a number of women get attracted to this stylish hairdo. 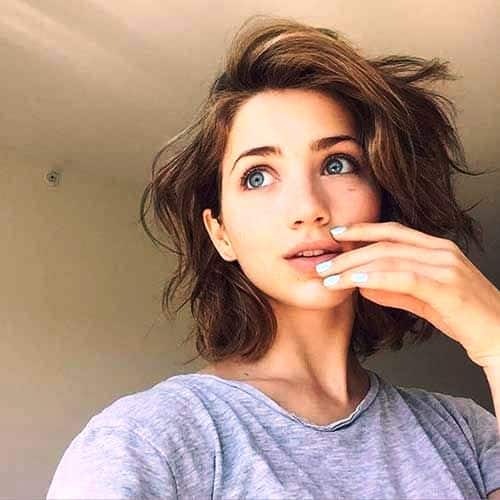 Messy lob with layers features heavy layers at the bottom. 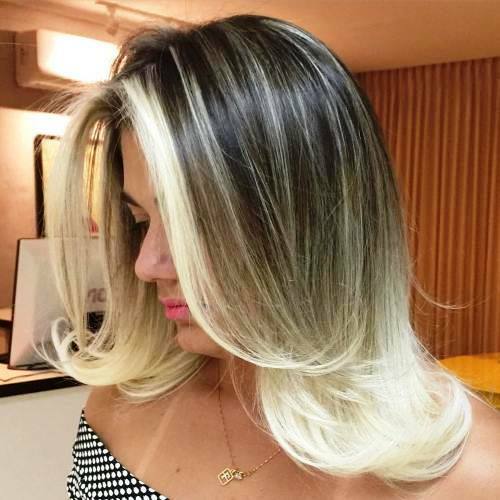 One can go for a dye of light color such as light blonde or brown to impart some cool vibes. Keep the hair a bit messy to create a playful and soft appearance. Hence, a blend of messy layers and soft color dye makes this cut a top choice of girls. This style is a great blend of a traditional Layered Haircut and heavy bangs, which looks so adorable and gentle! Especially for women with fine and thin hair, this hairdo is a great pick to create the illusion of thickness. On the front side, long bangs are incorporated and swept to one side. It creates an extra lift in the front flick, which is eye catching. 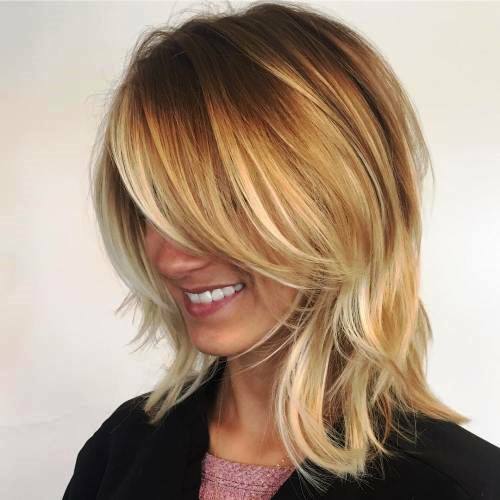 Try out a light color dye such as blonde to let your personality appear more beautiful than ever before, making this hairdo one of the best Layered Haircut for Fine Hair. This Layered Hairstyles is a great way of transforming the naturally sleek hair. It imparts an instant dimension which is too classy. Hairstylist cuts the manes at an inclined angle to make them look textured. A number of color dyes will go well with this cut. 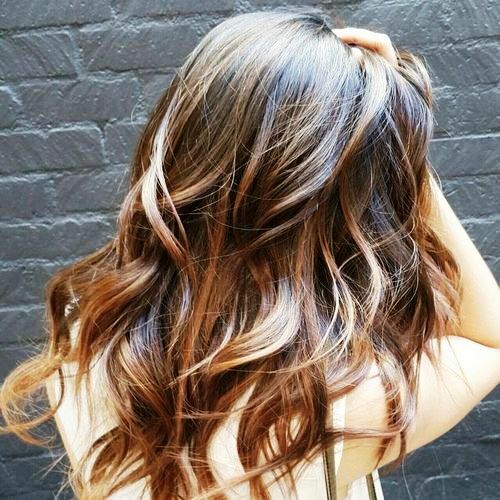 However, caramel Balayage is the one that has the power to rock this style in the best way possible. 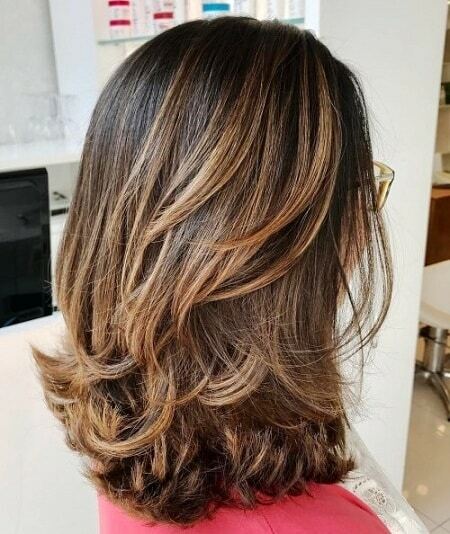 As the caramel hue is considered as one of the lightest yet brightest dye these days, making this one of the trendiest Medium Layered Hairstyle. 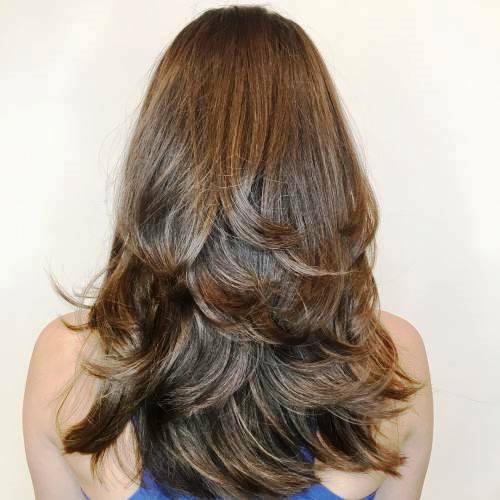 This Layered Hairstyle creates an adorable and bouncy appearance with full of volume and movement instantly! The layers are introduced at different lengths in this medium length hairdo to get a sassy look. The layers are gradually reduced in stacked pieces. Flip the ends with a heating rod and a rounded brush. A blow-dry is necessary to create an uplift for a voluminous illusion. Pair it with long earrings and high heels to let heads turn in all the upcoming parties! The layers are responsible for adding so much dimension and versatility in sleek hair texture. Long Layered Hairstyle are relatively easy to style in less time. One can keep the locks open or pinup or wear it in a bun when running short on time. This particular cut goes well for both thin and thick locks. The V-shaped bottom will add movement without much mess. Don’t use so much hairspray in order to avoid the crunchy hair look. Go for a good conditioner after hair wash to get a shine, which is necessary if you choose to wear the locks free. Therefore, the manes will look silky and smooth without much effort. This one is a nice option if you are looking for some light, easy breezy Layered Hairstyle for Long Hair. Keep the upper part of the hair straight. From below the jawline, start adding textured layers. Incorporate soft, loose beachy waves below this point. 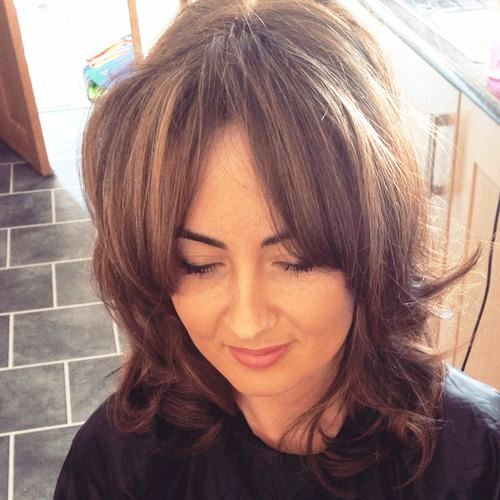 A combination of loose waves and textured layers will give an elegant lift which is the highlight of this haircut. Don’t go for bangs instead, add shorter layers on the front side for a face framing effect. Choose a light color dye which complements the sunny summer season. 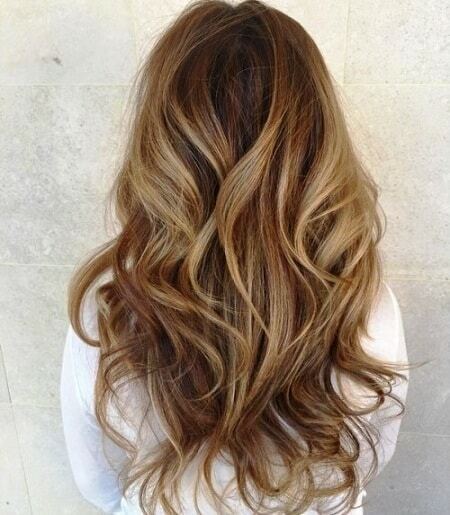 Moreover, the loose waves make you attend all your beach parties in a cool and bright way! This, a dramatic and sophisticated Medium Layered Hairstyles, is a full jam pack for all the ladies looking for a unique hairdo. It showcases manes in a glamorous way, either you choose to wear them in a ponytail or keep it down. To further add the brightness, go for a bit darker color dye. 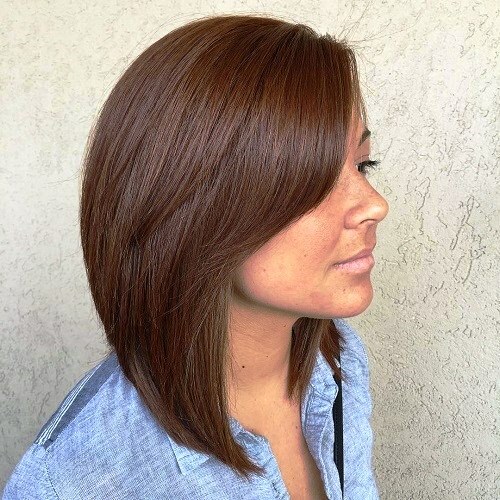 Chocolate brown or caramel is a great option in this regard. This cut is a heart winning option in almost all the gatherings! 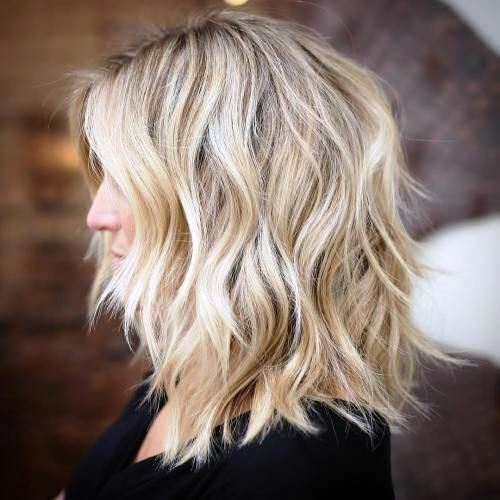 For ladies who are not comfortable for heavy layers as it takes years to get the hair back at a single length, can try out this simple Layered Hairstyle. 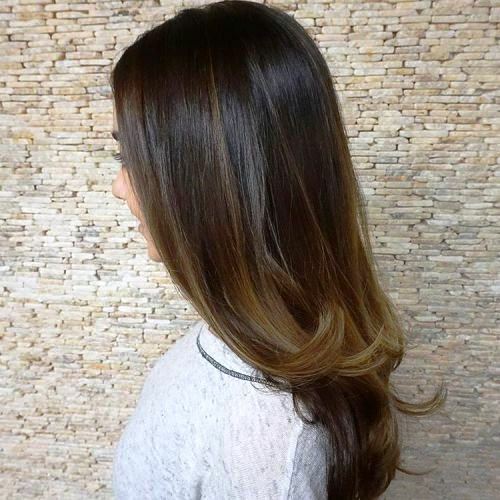 Ask your stylist to add very light layers spread equally throughout the crown. It will give the same amount of dimension and movement. However, the styling time will be exponentially reduced, which is a plus point. 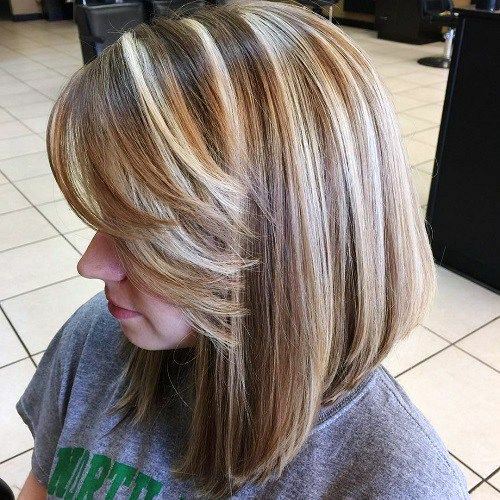 Furthermore, a blend of light and dark blonde highlights makes the cut more appealing and flattering. 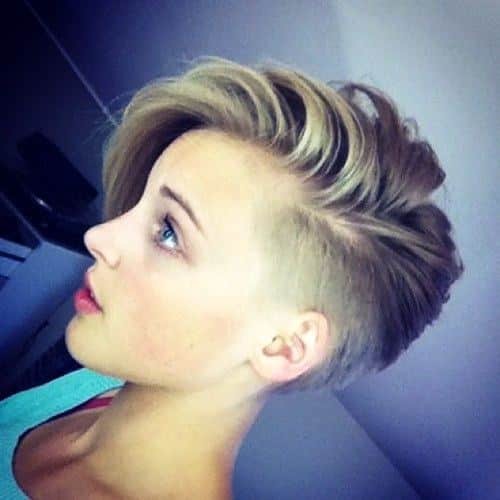 Looking for some unique Layered Hairstyles? How about trying a bedhead style with a sparkly red hue for mid length hair? The look created with this style is absolutely cool and adorable. A dry shampoo makes the hair perfect to carry out this cut in the most elegant way. With less styling headache, a sophisticated office going look can be generated. Red hue makes it more appealing than making it too edgy. No doubt, an effortlessly stylish and unique look is just a few minutes away with this hairdo. 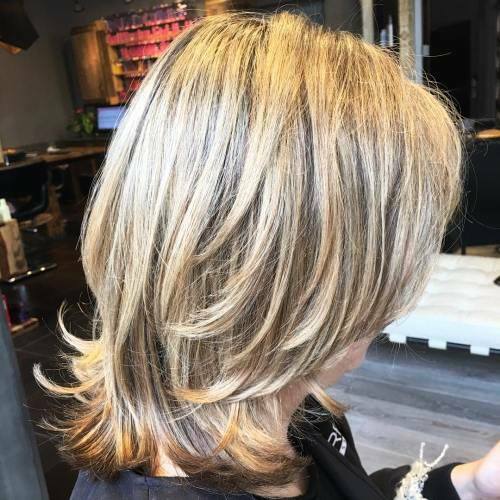 This Layered Hairstyles features an eye catching back view, where lots of layers cut in different lengths mixed together. A right kind of color dye makes it more charming. Go for a dye which is close to your natural hair color to keep the look simple. Blow drying with head down creates an uplift to get a voluminous appearance. Touch up the bottoms with a heating rod so that they look polished and well maintained. If you have super long hair and looking for some movement-adding Layered Hairstyles, which maintain the hair length should try this cut. The layers are added at different lengths as per the manes texture and the face shape. It makes manes appear healthy and dynamic. To make it spunkier, curl the ends with a heating rod. The end result is an absolutely adorable look which will never go unnoticed. Furthermore, to pronounce the style keep a single tone hair dye to get a voluminous illusion. Pair it with the minimal accessories and makeup for an instant glam appearance. This classic and wavy Layered Hairstyles will allow your manes to sway as you move! It comes up as a great free flowing style because the layers blend beautifully with the long locks. Instead of very tight curls, go for some loose ringlets all over the crown to get a soft touch. Finally, a middle parted style will frame the face and will get an eye catching look for yours. Moreover, choose a darker color hue as it complements the style well, such as chocolate brown and caramel. This look reminds of some fairy tale princess, isn’t it? The body and bounce, this Layered Hairstyles imparts an unparalleled look. Layers are imparted at the bottom in tiers to form a full of glam shape. It takes away the heaviness and bulk from very thick locks. Flip all the ends with a curling rod in the outward position. 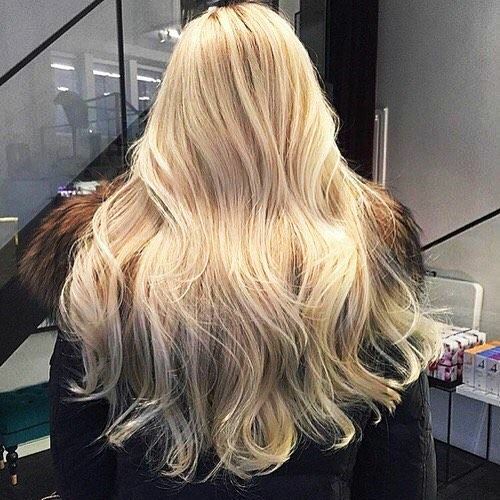 A light blonde dye further softens the overall image. The end result is absolutely alluring and chic look, which is worth keeping. A good quality serum is a must to keep the manes in the right position for a bit longer period of time. Not each and every Short Layered Haircut has to go super edgy and crazy. A rather simple and soft look can also be created this way. The delicate layers with soft color dyes work well if you are not looking for any high glam styling option. Instead of going for heavy layers, ask your stylist to impart layers only at the points where the dimension is lacking. In an effortless manner, you are all ready to steal the show! Every girl wants to look well styled and well groomed. How you wear your hair plays an important part in reflecting your personality. The movement and dimension are two important factors which play an important role in showcasing your manes. No matter what is the hair length, short, medium, or Long, Layered Hairstyles can impart unmatched body to all of the hair types. Layers can reduce the heaviness from the thick locks whereas, add volume to thin manes. Hence, such hairdos accommodate all types of hair textures in an elegant way. 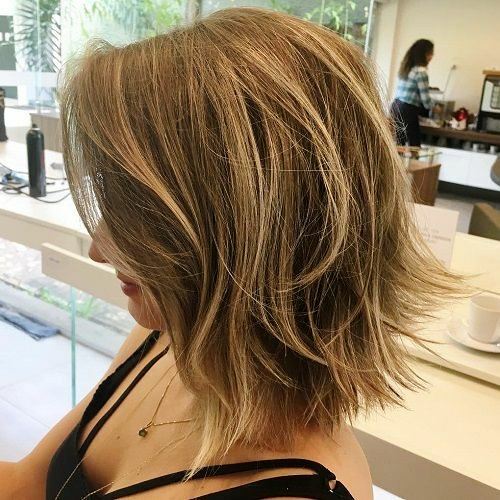 Accept the importance of a right kind of hairdo and select your favorite style from the above mentioned Layered Hairstyles for your next makeover!